Giant Stride ca. 1910-1915 as would be seen on a Model Playground. On warm spring evenings, blustery fall afternoons, and sticky summer days, when nostalgia and memories brush past you, where does your mind go? Where did you spend many hours as a school-age child? For most of us it was a playground, whether climbing the playground equipment or running circles on the athletic field, letting our imaginations take us anywhere and everywhere. Yet this was not always the case. Children of the 19th century didn’t have formal playgrounds. Originating as “sand gardens” in Germany in 1885, the beginnings of playgrounds appeared in the United States in Boston in 1886. 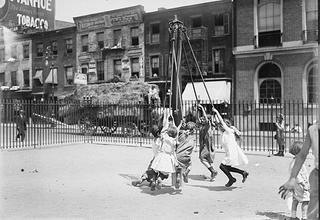 And until the turn of the 20th century, playgrounds remained uncommon in public spaces. But as industrialization and urbanization grew, so did the concern for public welfare. Humanitarians saw playgrounds as the solution to cramped quarters, poor air quality, and social isolation. This new concept could keep children off the dangerous streets and help them develop their physical health, good habits, socialization skills, and the pleasure of being a child. Novelty Playground, date unknown, possibly 1950s from Camp Dearborn in Milford, Michigan. In 1906, the Playground Association of America formed to promote ideas of playgrounds to communities, including benefits, construction, layout and design, and the conduct and activities to occur on playgrounds. Contemporary literature dictated that an ideal, proper playground would have separate play sections and athletic fields for boys and girls; would be supervised; and would feature shelters and toilet/bathing facilities, shaded spaces, garden plots, and swimming or wading pools. Playgrounds were not free-form in the early 1900s. People were trained as instructors to teach children necessary lessons and organize their play. Play could include equipment lessons, parades, theater productions, and other activities. Of course, variations could be found throughout cities and in rural areas, determined by a community’s allotted space and finances. Soon, manufacturing companies found new business in playground apparatuses. Early apparatuses were built with galvanized steel pipes, strikingly vertical and horizontal elements, ladders, and chains -- all of which are considered dangerous by today’s standards according to the Consumer Product Safety Commission. As they aged, apparatuses were replaced by newer designs and equipment. Materials for playground construction changed to include earthen materials, concrete, wood and plastics. The history of playground development is long and detailed, but for a well-sourced, well-researched article, see The Evolution of American Playgrounds by Dr. Joe Frost of the University of Texas at Austin. 1930s-1940s: Development Slowed Suspended due to Depression and War Efforts. Those early playgrounds are no longer what we have today with the rounded edges, molded plastic, and soft ground cover, and purely creative landscapes to prevent injuries and engage the mind. So, it raises the question: If playgrounds do not have their original equipment, what is a historic playground? 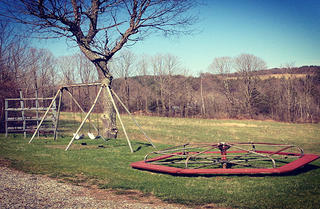 Model Playground Era Equipment from a rural Vermont schoolhouse featuring a jungle gym, swings, and a merry-go-round, ca. 1920s (Craftsbury). That is difficult to answer. 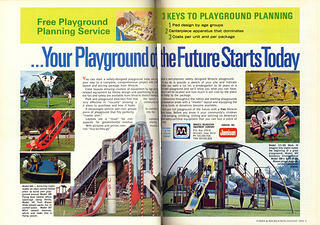 Most obviously it would be one with its original layout and playground equipment. These would be significant historic resources, a time machine to playgrounds of the past. 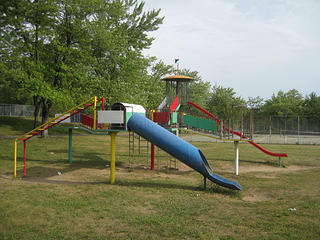 However, an extant playground from the past could not be preserved for play due to safety regulations. Rehabilitation, restoration, and preservation of a historic playground are not feasible. That’s not to say that old playgrounds do not exist or cannot be found, but it does mean that the physical elements are ephemeral. What then is historic about a playground, if the apparatuses have changed? Playgrounds are about more than equipment. Their location, design and construction speak to humanitarian goals, school activities, community development and planning, which offer cultural context. The value of a playground lies in place. Beginning as healthy respites for urban dwellers and expanding to be safe places for children to gather with adults, playgrounds have continued to host community events, sporting games, and outings for all ages. Children enjoy carefree days, and adults remember those carefree days. In preservation, we look at place in its simplest form -- those spots where we feel, remember, experience, and belong to something. Playgrounds are places that speak to everyone. So, fueled by nostalgia, we seek to know more, discovering that things as simple as slides and swings have a significant chapter in cultural history. Author’s Note: This post is an abridged version of a paper written by Kaitlin O’Shea for HP201: History on the Land in the University of Vermont Historic Preservation Graduate Program. This paper was researched using issues of the periodical, The American City, from the 1900s-1920s. If interested in learning more, please email Kaitlin. Ed. Note: Over the next few weeks we are featuring older and historic playgrounds from around the country that show the evolution of play. Stay tuned!